Brick Lane is one of those streets in London more likely to have been heard of than others. Whether it’s Monica Ali’s novel, or the history of the East End, or (perhaps now the most likely reason) its reputation as retro-central, it’s something of a hotspot for hipsters and tourists alike. I first visited at thirteen, tempted by talk of vintage shop Beyond Retro. I returned with a grey shirt with white frills at the neck and a mint green sixties, shaped tunic dress. This tunic once hung loose where it now fits tight. Years pass, bodies change and the wardrobe grows ever larger. I still love to brave the Sunday crowds every so often, pushing through hoards of faux fur in winter and skater skirts in summer. Mulled wine is sold when it’s cold, cool drinks in the warmth of June. All year round it’s an intriguing clash of flea markets, food stalls, buskers, vintage shops and cafes. It’s a place often planned in advance to visit, but the occasional impromptu trip – the spur of the moment suggestion to head East – can be more exciting. It’s a place to look around, listen to passing snippets of conversation, run fingers over glittery skirts. At lunch time the queue outside the Beigel Bake shop stretches down the street. The pavements always heave at the weekend, while the shops are as squeezed as goldfish in a puddle. Sadly, the gems are harder to find now. One has to battle through stacks of ‘ironic’ jumpers and eighties-does-fifties synthetic tea dresses to sniff out the more extraordinary items. Yet somehow my mum and I had a large dose of luck on our last visit just after Christmas. We’d forgotten that sales were in full swing in other places than the high street, and so marveled on discovering the half-price rails and labels with ever-lower prices crossed out several times and re-written in red. Where usually a trip might yield one or two choice second hand items, we returned home dragging bags spilling with spoils. Among them was a zip-up black velvet cat-suit, a blue sequined red carpet worthy sheath dress with a split up one side, a fifties red and black dress with full pleated swing skirt and cats-eye sunglasses to match. There was an inordinate amount of black velvet, stretching from daytime trousers to the evening glamour of a cocktail dress. It was a joy to have the leisure of several hours to explore, pick out clothes, try them on. Where usually London requires careful monitoring of time, full of glances at the watch before the next meeting or event, we had the whole afternoon to wander. Nearly all the items bought need to be altered – a seam pulled in here, a hemline rectified there. One of the pairs of trousers has already been cut down to shorts, and the sleeves removed from a dress to refashion it, while a purple velvet midi-dress is destined to be a mini. Old clothes fitted anew. The black velvet trousers were found at Rokit during this mega vintage spree. 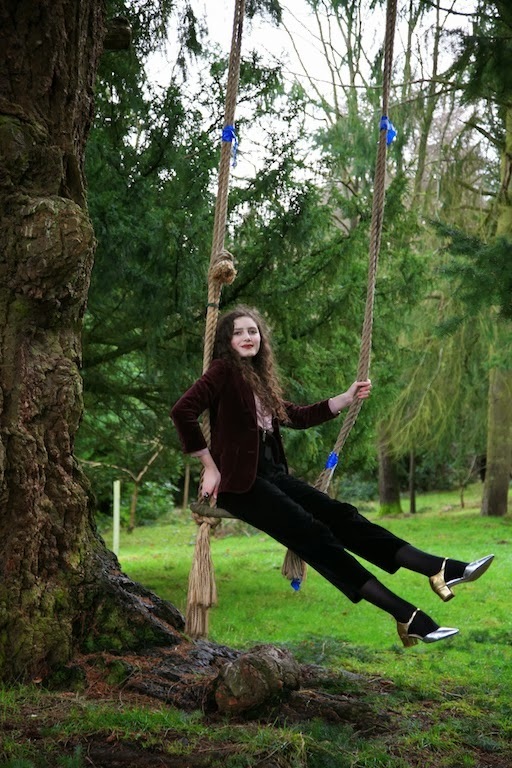 Here they're worn with a vintage St Michael velvet blazer, second hand Paul Costelloe shirt, ASOS shoes (they make me feel like Ginger Rogers) and family-inherited jewellery. I had to nimbly avoid all mud and puddles while shooting these photos. This outfit is actually a variation on one that I wore to the awards ceremony of the Hippocrates Poetry Prize last year, where I was completely thrilled to pick up my prize for winning the Young Poets category for a poem on spinal surgery (you can see the press release here and poem on the NAWE website). Entry has been extended for their 2014 prize, so if you're aged 14-18 and fancy writing and submitting a poem on a medical theme then you have eight days left before the deadline on the 10th of February. You can see more details on the £500 prize here. I LOVE good sales and getting tons of pieces! That velvet jacket is sumptuous looking! I would love to own such a garment. However, I am quite a lint magnet these days and would have an awful time with it! I do love it though! Fantastic outfit, those shoes lift it to another level! The silver shoes in particular made me love this look. The photographs (as always) are very beautiful and a joy to look at. You have a lovely way of painting the picture when you write, I had the feeling I was shopping at that place myself. The poem is beautiful, I must admit that I have never read a poem on that subject and was wondering what it will look like. For some personal reasons, the poem left a bit of a bitter taste in my mouth. It had reminded me of what I probably should have done, but had failed to do. I too have scoliosis (double almost 50 degrees) but in mid of all my other health problems it was somehow pushed aside. I sometimes wonder should I have gone trough with the surgery or not but at the time the doctors suggested it to me, I was still a child so it wasn't really my decision. Surgery is always frightening ( I have had 4 so far) but often it is the right decision. There are times when I wonder what health really means. Is it in some sense a state of mind? I also look forward to seeing the velvet catsuit! Sounds crazy-amazing. The shoes totally Ginger up this gorgeous outfit. You look wonderfully leggy in the beautiful black trousers, a great Brick Lane find, and the lush plum velvet of your jacket brings out the russet tones of your hair gloriously. Now I want to see you dance! Hoping you danced up to the stage when you won that poetry award, what a brilliant achievement! I'm off to read your poem at that link in a min. And thanks so much for your kind congratulations on my news my dear! I love the combination of velvet-on-velvet with the contrast of the stark metallic shoes. Beautiful, as always. beautiful combination of color and lovely look!